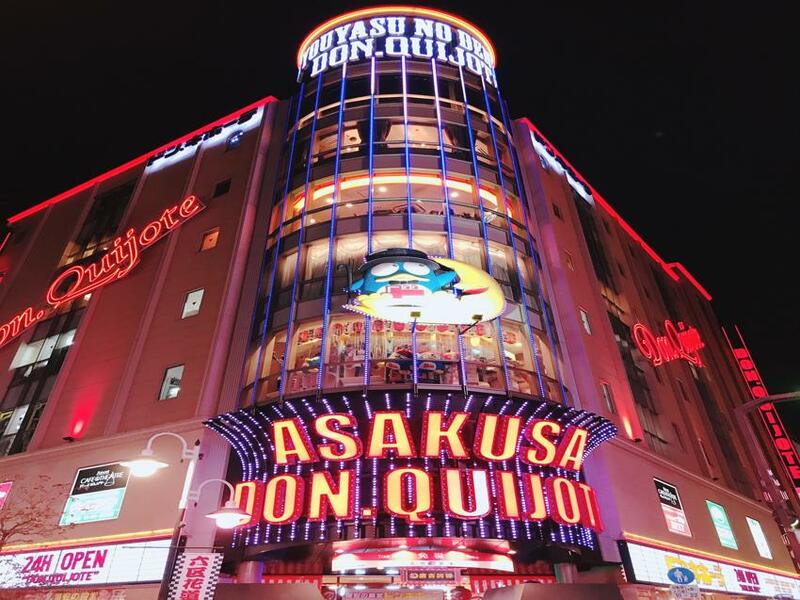 Coming to Japan is almost an annual pilgrimage for us over the last couple of years. 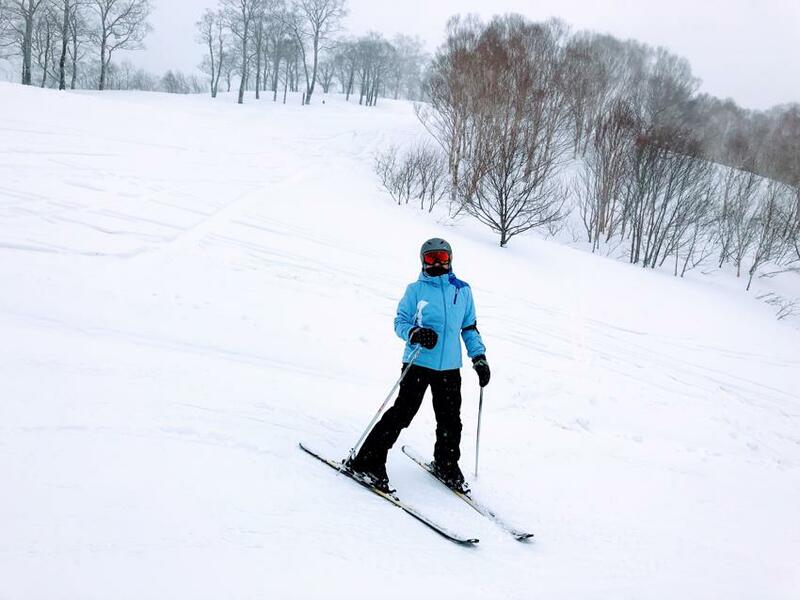 This year is no different, and it’s always about a bit of skiing, a bit of onsen (hot spring), a bit window shopping, a bit about food and a bit of sightseeing. This year’s trip is a 12 days affair starting on the 26th Jan, leaving on 6th Feb. We flew Delta Airlines this year, which is probably the first time we flew with them (I think). Unlike any other airline I can remember, this is probably the first airline I’ve taken where they offered 2 x 23kg check in luggage per person, with a economy ticket! With 3 of us travelling, that’s a potential of 6 x check in luggage! No need to worry about going over the weight limit at all!! Why didn’t I discover this airline sooner?? On top of that, the in-flight entertainment where you get to watch most movies/shows on your own iPad was definitely worth calling out. It’s probably offered by other airlines like Singapore Airlines too, but it’s the first time I actually used it. 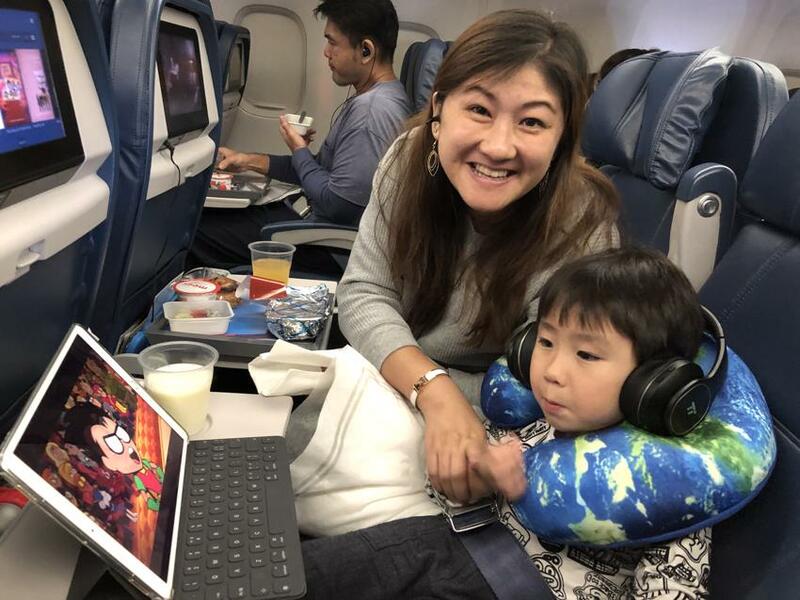 I like the idea of being able to use your own iPad and your own set of ANC (Anti-noise cancelling) headphones connected to WiFi to watch the range of movies/series. No crappy cheap headphones that can hurt your ears! Ethan loved it! 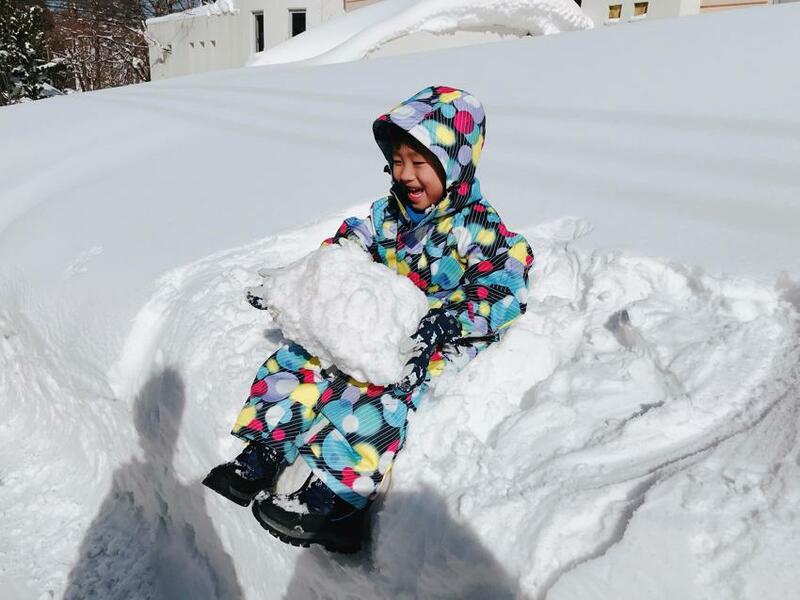 As for the choice of ski resort , we went with Naeba this year. Not that Naeba is a particularly well known resort (specifically Prince Naeba Resort) for foreigners (at least not to Australians or South East Asia). 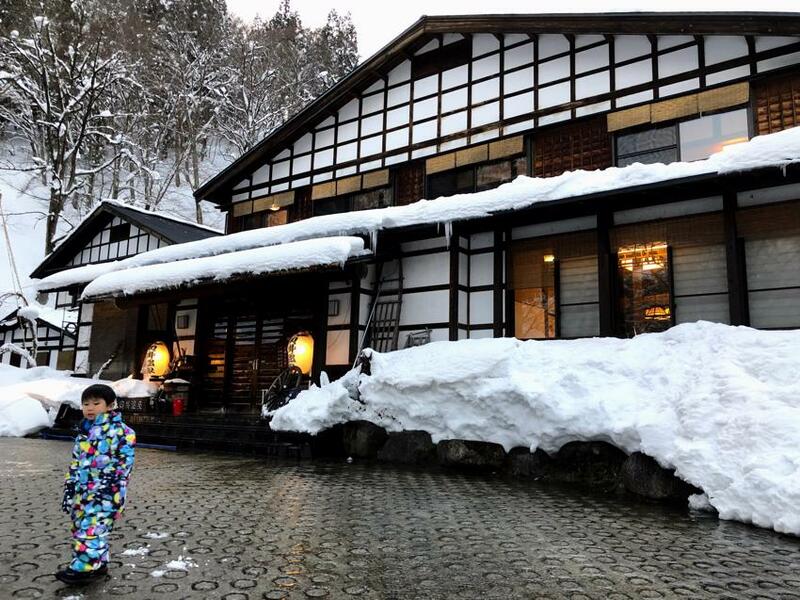 I’ve deliberately gone with a different one each year, with the hope to go to a resort that isn’t overcrowded and hopefully as good if not better than the usual suspects like Hakuba or Niseko. 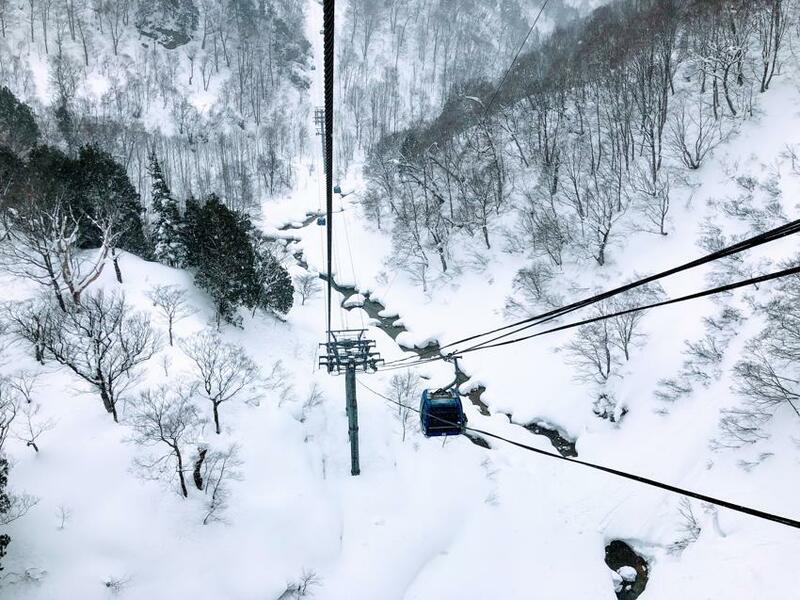 Naeba is located within a 2 hours Shinkansen + a short bus ride from Tokyo, which is one reason why I love resorts on the main island of Japan. 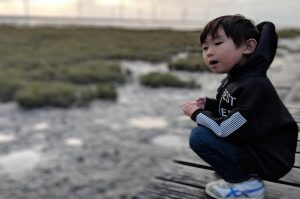 Also, with Ethan now 4.5 years old, I am hoping to finally get his feet “wet” on a set of skis (not just taking photos on it). 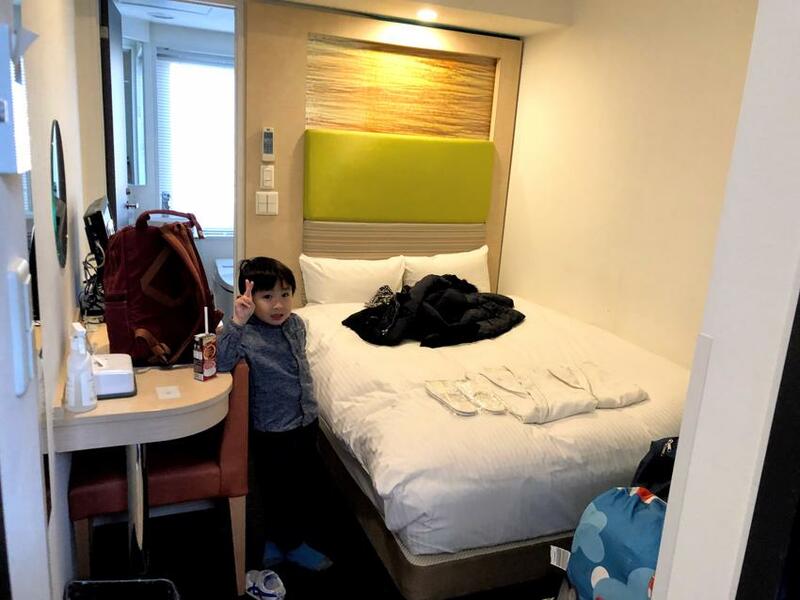 As we arrived into Narita airport late in the afternoon on the first day, we planned for a single overnight stay at Ueno Hotel (sort of near Ueno Station). It was meant to be a quick overnight stay, so I probably skimp a little too much with this one, trying to fit us in a tiny room with 3 of us, along with 4 x luggage in there probably wasn’t the best idea. 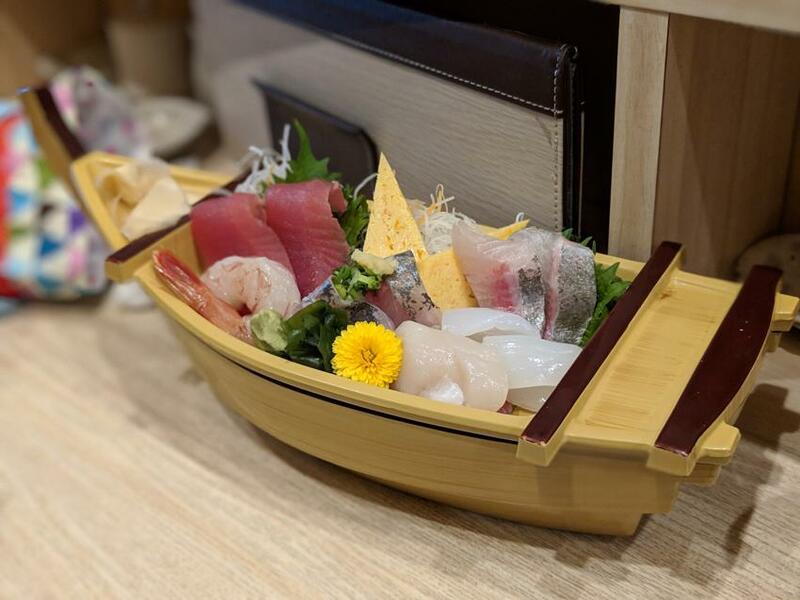 We didn’t have to look hard for fresh and just plain tasty sushi either! 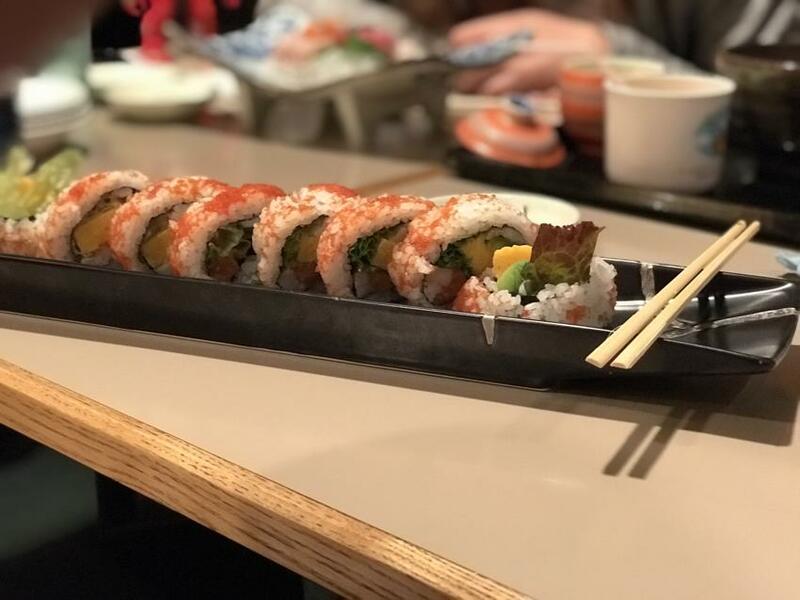 We just randomly popped into one called “Edomae Sushi Uohei” (江戸前寿司：魚平), and it was definitely good sushi by our books (and didn’t break our bank either). Anyway, the weather was definitely on the cold side, though bearable. 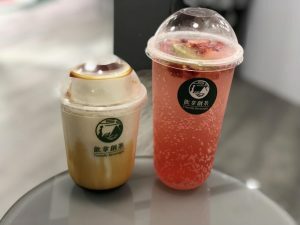 It was nice to see a few familiar names like Don Don Donki, Gong Cha (not even Japanese)..
It’s not very exciting when you get pretty much all the same brand names back in Singapore as well! That’s what you get with globalisation unfortunately! 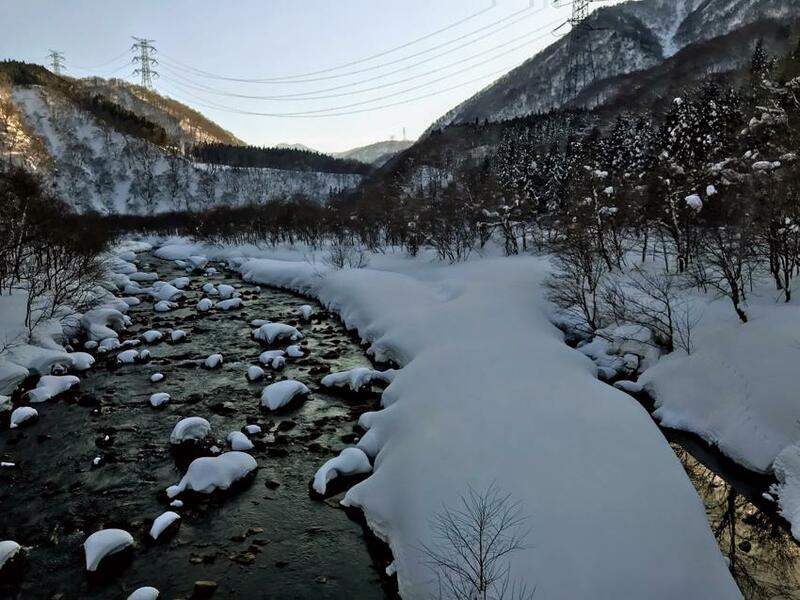 Anyway, we got through the night, and it was another half a day effort to get to Prince Naeba Resort (苗場プリンスホテル), first with a Shinkansen ride to Yuzawa (湯沢) , followed by a 20 mins bus (provided by the resort). 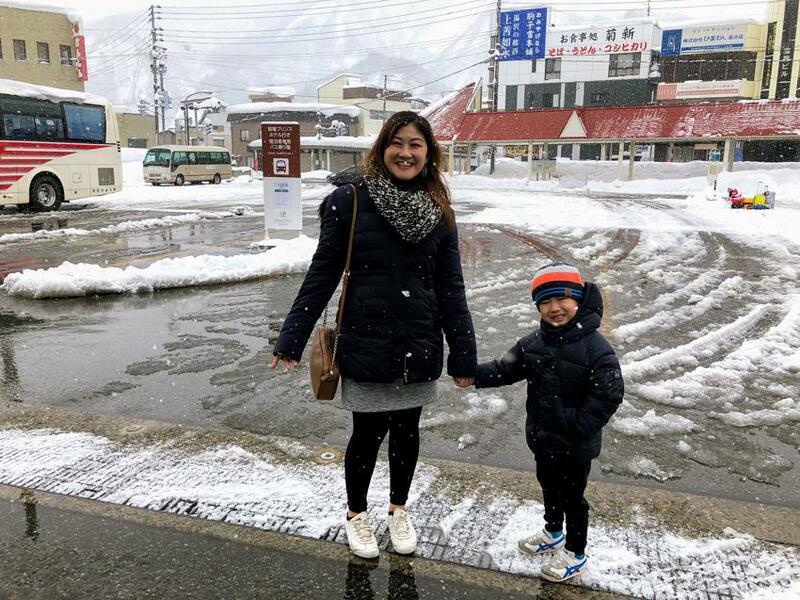 One can definitely feel the change in scenery (and the weather for that matter) going from “sunny” Tokyo, to completely snowy Naeba! We settled ourselves into our room in building #2 (I think there are 6 x buildings altogether), up on level 10 in room 21-006. I was definitely happy with the view out of our window (main gondola of Naeba)..
Granted, the hotel did feel a tad old. But it did come across as a well maintained hotel. It certainly wasn’t priced like a budget hotel! 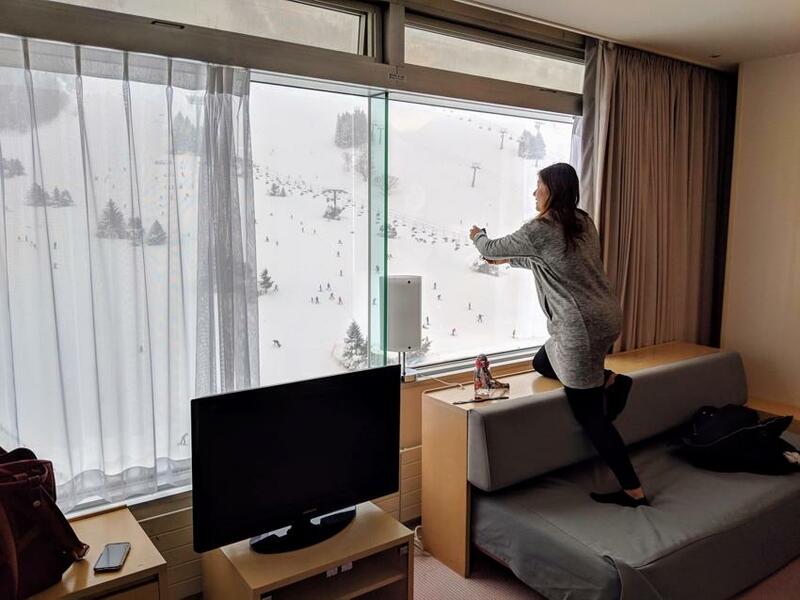 Whilst I felt the nightly rate for the room was reasonable, just about everything else offered were overpriced including restaurants, ski lessons, rentals etc etc. And for such a nice resort, the 2 public baths (not even onsen) weren’t all that great. Fortunately, there were better alternatives outside of the resort which I will talk about later. 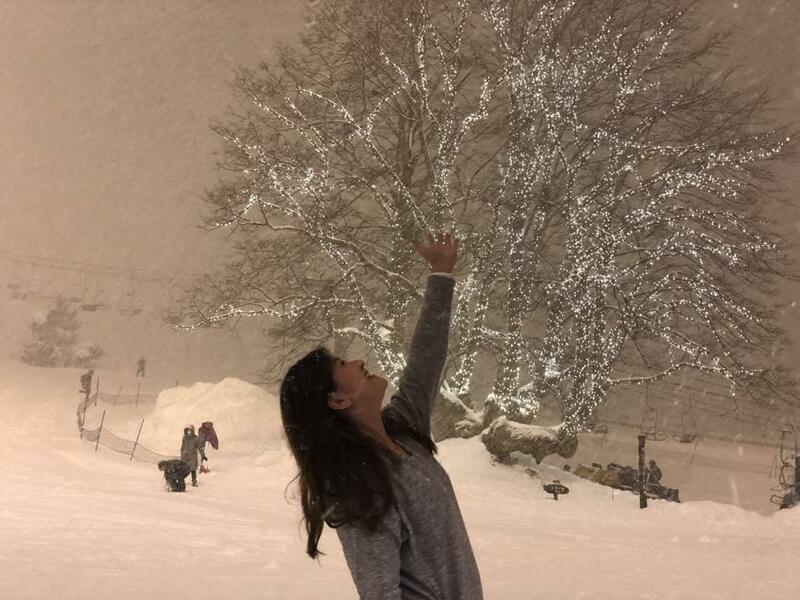 More importantly, the snow outside is good! 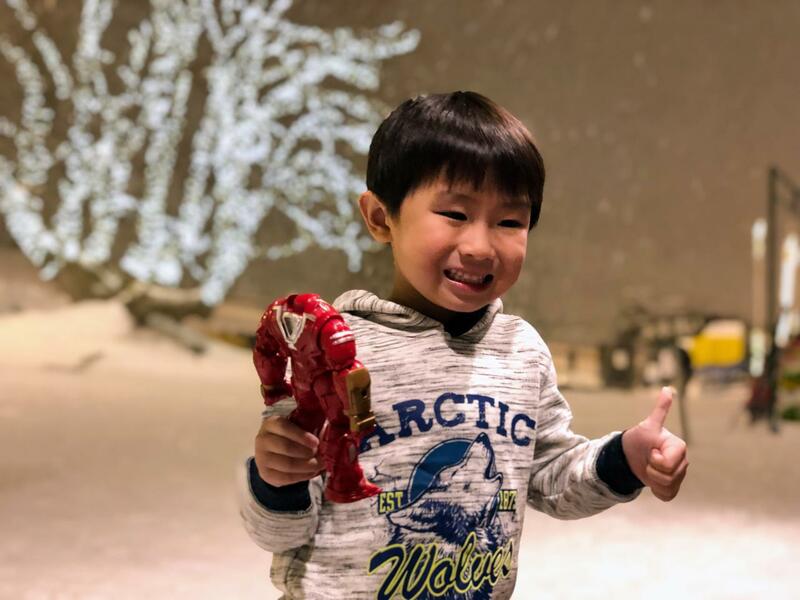 It’s good to see that Ethan actually liked going outside just to play with snow! That’s a BIG step forward compared to previous years! 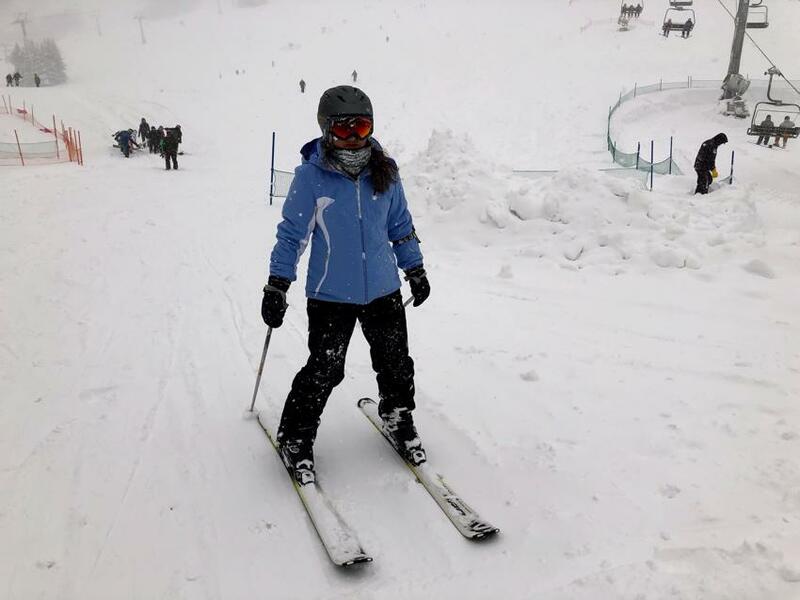 Fortunately, the skiing itself was also a highlight. 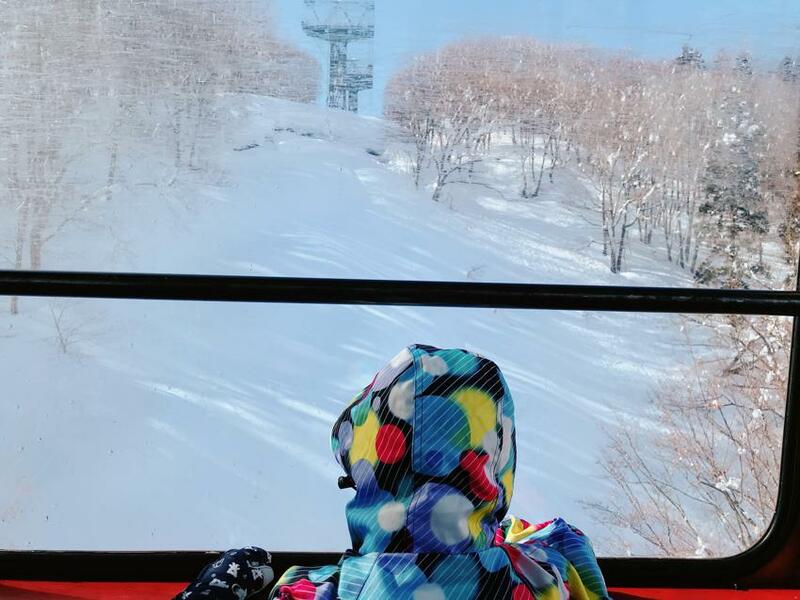 Ski lift tickets were reasonable (around 5200 yen that covers the whole mountain, and if it’s Tuesday or Thursday, ladies ski for just 4200 yen). Night skiing was available every night which I thought was fantastic. Out of the 4 full days of skiing, we were lucky to get a HUGE dump of snow though it was too windy for the gondola that takes up to the top of Mt. 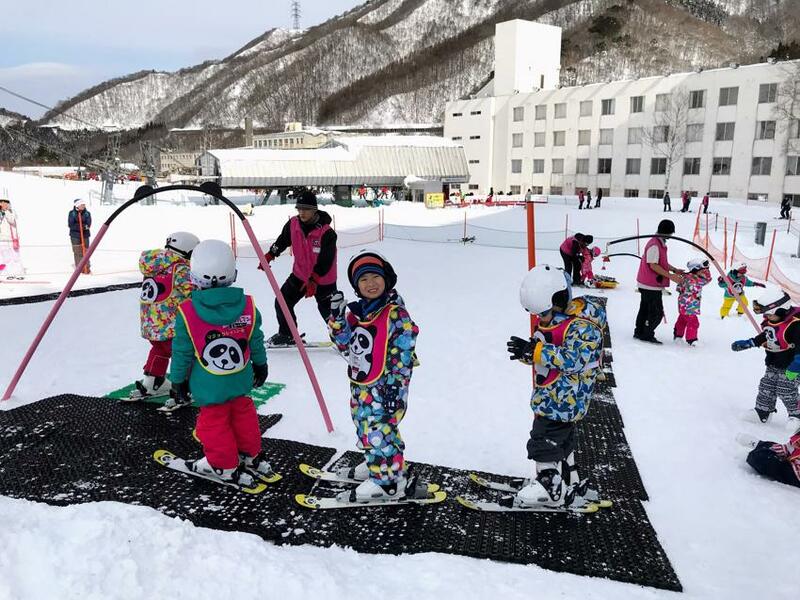 Naeba to operate. On the plus side, it was a good “warm up” day for all of us. What is especially good with this trip is that Ethan is ready to go to Ski school. 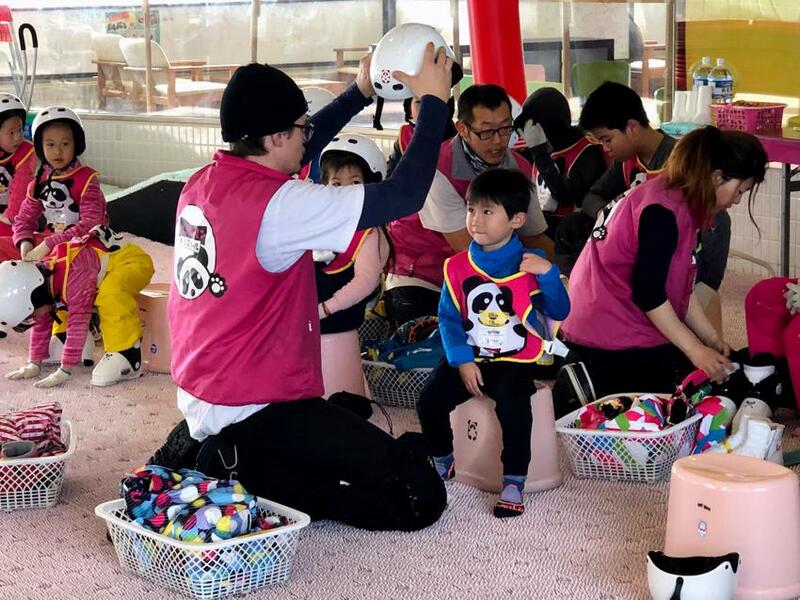 There was one at the resort called Naeba Pandaruman Kids Ski School, so we chucked Ethan into his first ski lesson (just 2 hours for the first one for 8000 yen). 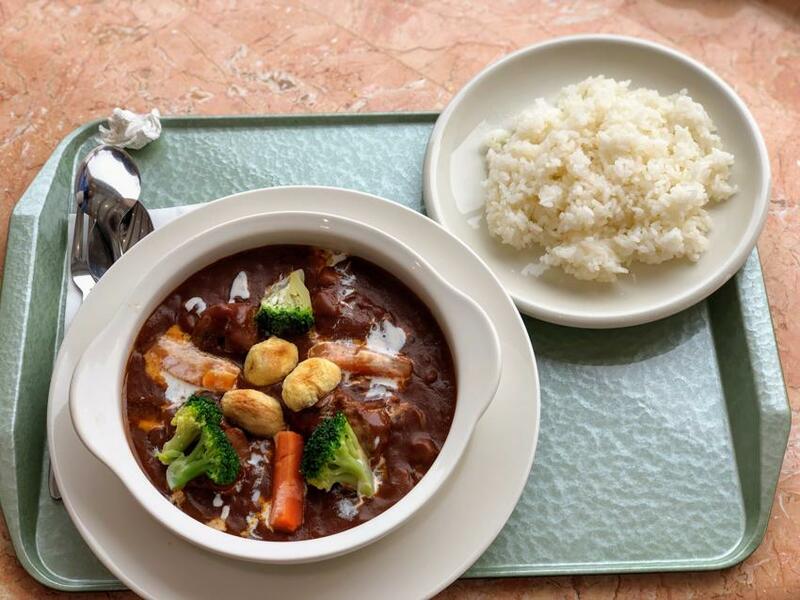 It’s certainly not cheap at 8000 yen for just 2 hours! (i.e. approx. ~SGD$100), given it’s a group lesson! But I must admit it’s the first time I’ve come across (or perhaps noticed) a kids ski school with an indoor training ground. Essentially all the lessons come with 1 hour of indoor practice, followed by 1 hour of outdoor practice. In my mind, that sounded like a good idea. 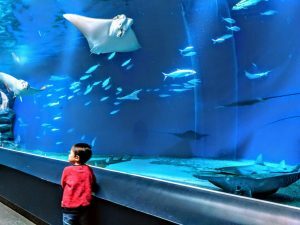 The only downside from memory was the fact that, majority of the tourists here at Naeba appeared to be either from Taiwan or from Hong Kong. So guess what? The lessons were primarily in mandarin! Unfortunately, mandarin isn’t Ethan’s strong point, and English wasn’t most of the instructor’s strong point either! It didn’t seem to be a big issue, and Ethan appear to have enjoyed it anyway. In the mean time, myself and wifey got to have a few warm up runs in totally fluffy snow (even though they were just about all “green” / beginner runs). 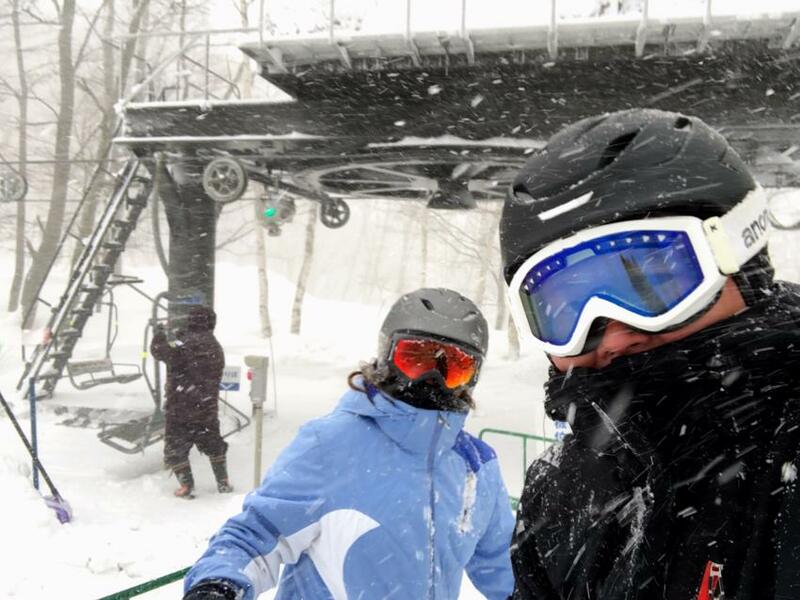 One good thing about skiing here, especially in the middle of the week is that there will be times where we were literally the only one going down the run, and going up the ski lift! 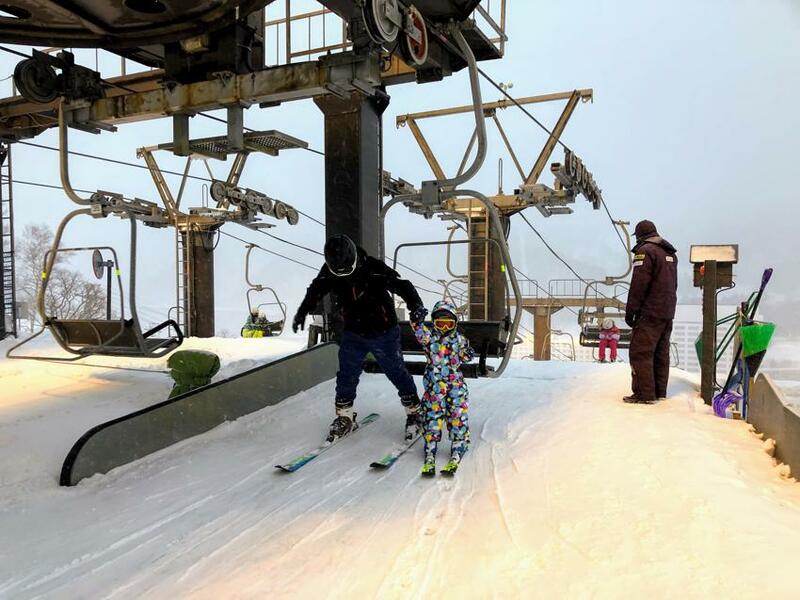 Seeing that Ethan enjoyed the ski lesson so much (he actually said he wanted to go again), we ended up putting him in another half day lesson next day. But the snow condition wasn’t quite as good, although all ski lifts were open. I ended up going skiing quite a bit myself, exploring the more difficult runs from the top of Mt. Naeba. By lunch time though, we pretty much called it quits, saving our energy / leg strength for another day. 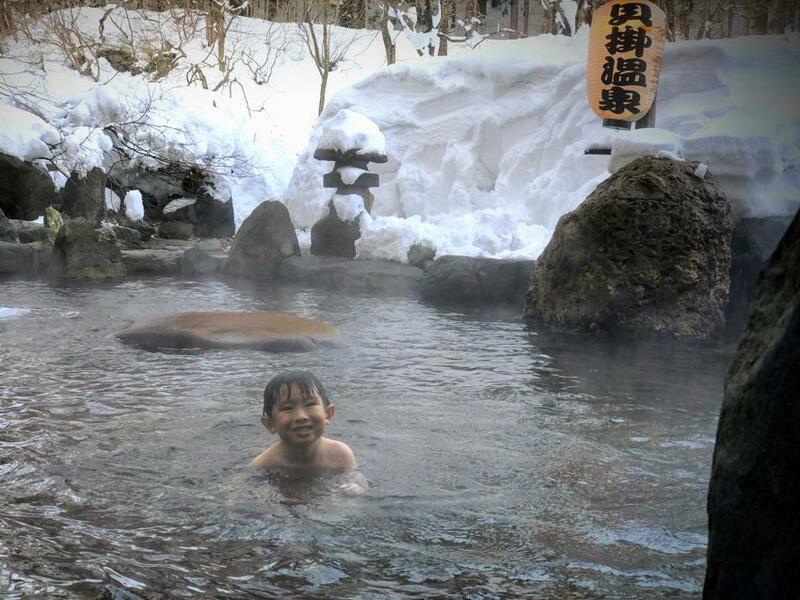 With ample time in the afternoon, we actually went to a small onsen out in the town centre called Yukisasae Onsen (雪ささ之湯). It would have been a 15 mins walk, except it was snowing quite heavily. Fortunately, we found out that the onsen house offers shuttle rides! How nice! The onsen itself was definitely a lot better than the 2 on offer at the resort itself. The bath water itself was mineral heavy though, probably the “heaviest” that I have come across for a while. On the 3rd day, we decided to take a break from skiing altogether, as it didn’t snow much the previous night, which meant skiing wouldn’t be as good. Being a clear “sunny” day, we went for a stroll out of the resort towards town. Except, the town really didn’t have much to offer. Ethan did find the stockpiles of snow on the road side more fun. 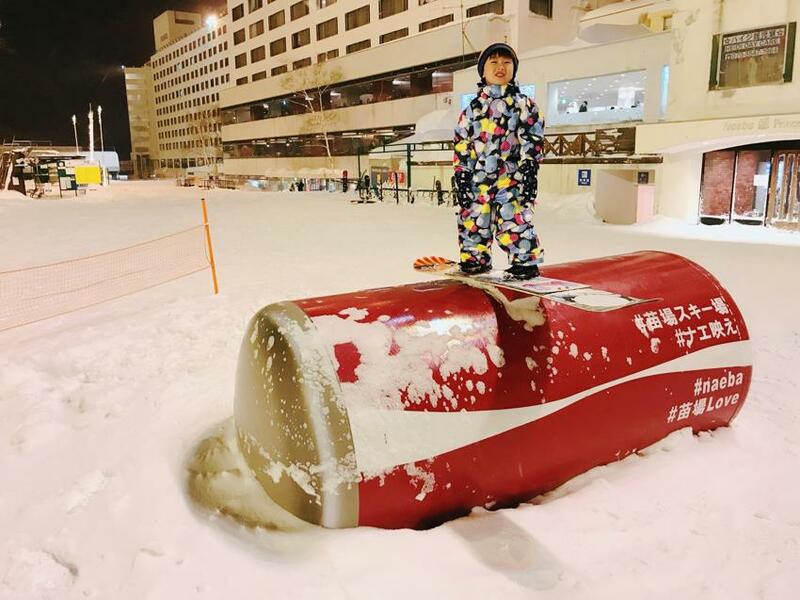 Quite a few times, we just plonked him up on top of it, and he would just sit there throwing snowballs. Seeing that there wasn’t much on offer in town, we ended up taking a bus out towards Kagura / Mitsumata. It’s essentially another ski resort about 20 mins bus ride away. Once we got there, apart from a parking lot and a few small shops, we were soon bored again. We eventually took the ropeway up the mountain to the base of the skiing mountain. Ethan enjoyed the ride up for sure! 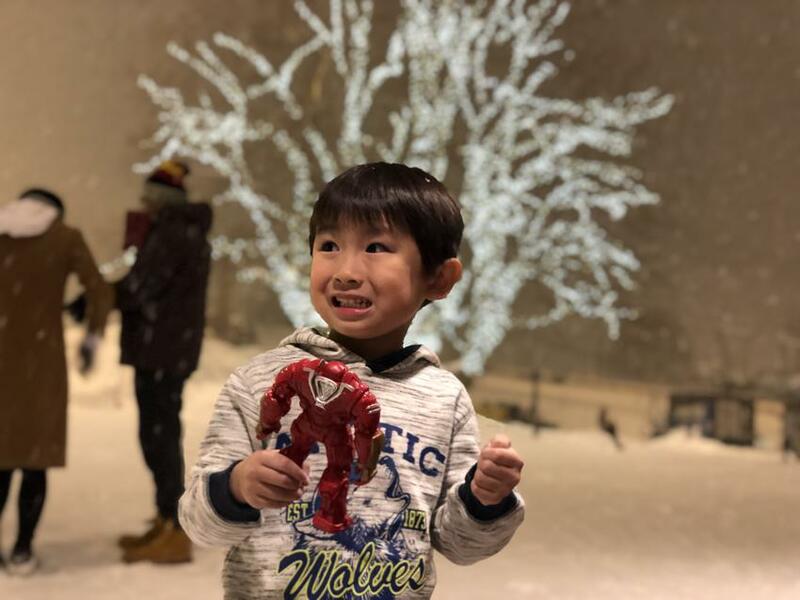 But apart from that, we spent the rest of the time in a restaurant up the top, read a book, played some toys, enjoyed the scenery and threw a few snowballs around, before we head back down. By late afternoon, I made a last minute call to go to a nearby onsen resort, apparently known to be good for your eyes. It was called Kaikake Onsen (貝掛温泉). Again, we took a bus there (just a single stop), and was quite surprised when we saw a van there waiting for us. It turned out to be a van for another group of tourists who have booked to stay there. Luckily they let us tag along anyway and enjoyed the ride in to the resort itself. It really felt like we were going to some secret resort hidden deep in the woods. The scenery was certainly pretty awesome! 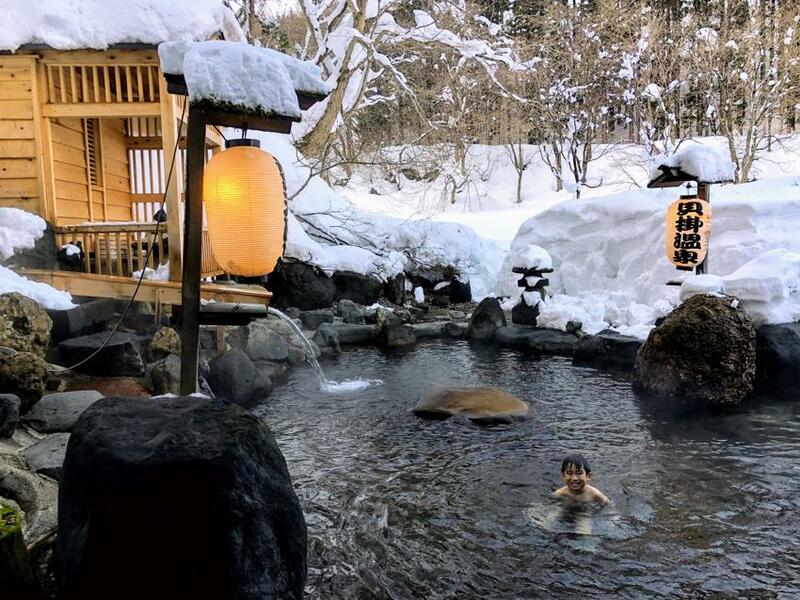 Once we arrived, the onsen itself didn’t disappoint. Myself and Ethan certainly enjoyed both the outdoor and the indoor baths they had. Best of all, there were absolutely no one else apart from myself and Ethan for the first 20 mins or so! It’s probably the first time I spent quite a bit of time immersing my head into the water with my eyes open, given this is suppose to be the onsen that is supposedly “good for your eyes”. It’s probably also the reason why the main bath water wasn’t all that hot. I imagine most would hang around busy splashing the “special” water onto their eyes! 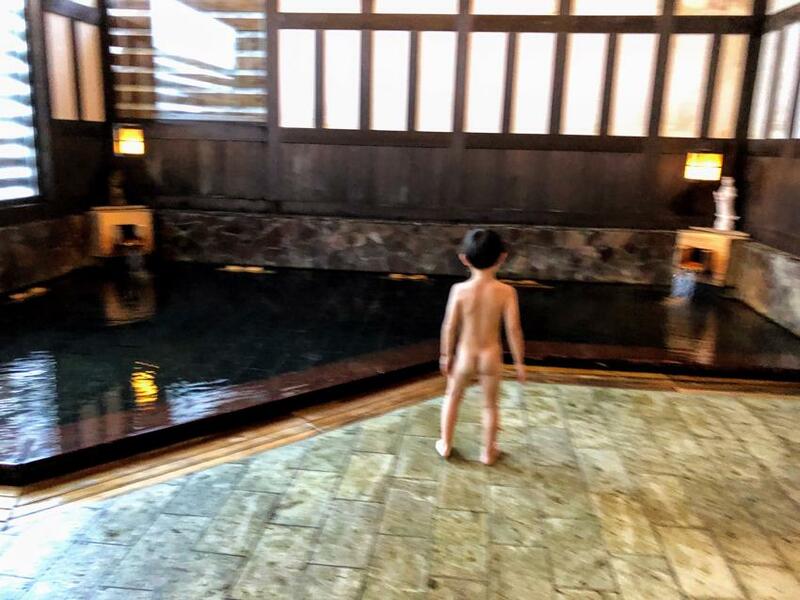 Anyway, this onsen was definitely a highlight for me this trip. Worth going! 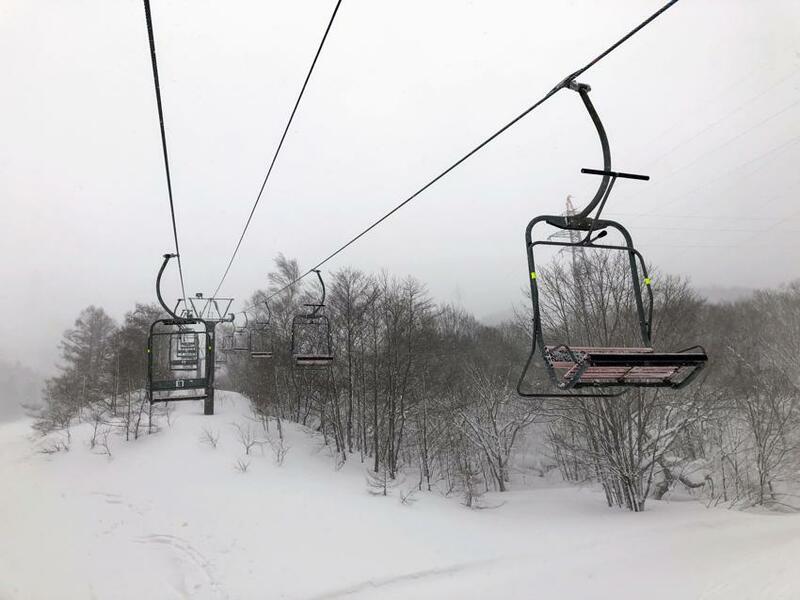 It wasn’t until the 4th day that we actually skied across to Kagura (connected to the main Naeba resort by a long gondola ride). 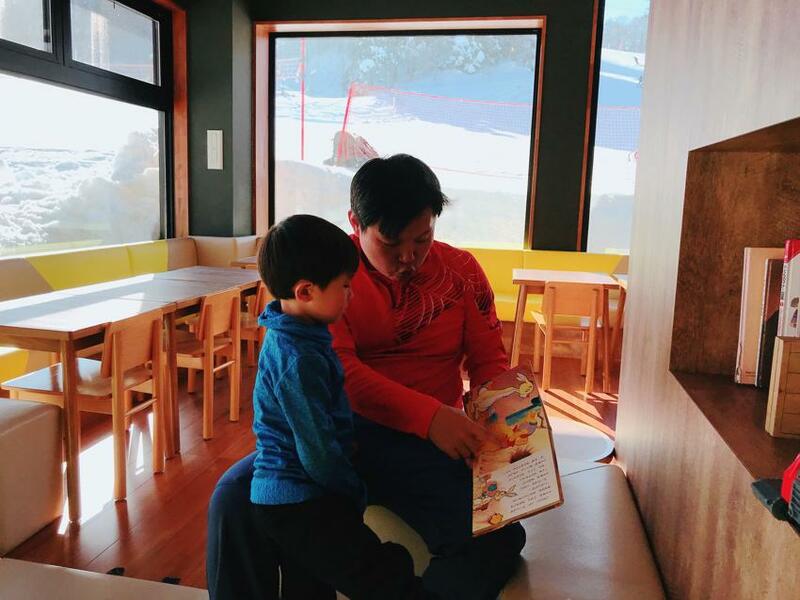 Once again, we dumped Ethan in the ski school (for a full day again including lunch for 16000 yen or ~SGD$200). Myself and wifey were then off to start the journey to Kagura from Naeba. It involved a very long gondola ride (called Dragondola) across, with a pretty awesome view. This was followed by a LOT of short lifts and ski runs to eventually make it all the way to the same Mitsumata resort where we were the day before (by bus). 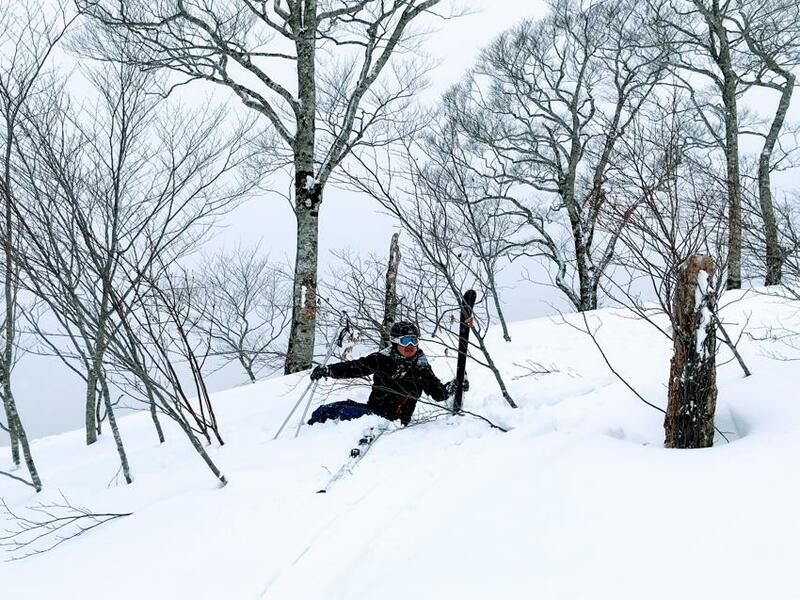 It consisted mainly of green runs though, so not a lot of challenging skiing at all. Nevertheless it was probably the only day this week where we could say that we leveraged the FULL value of the lift tickets we bought! It was also too cloudy to see the lake as well, which apparently would have offered an awesome view on a good day. Nevertheless, it was THE day for cruisy skiing. Occasionally I got off track a little and got a little too adventurous and got stuck in a bit of powder. Most of the restaurants were either quiet, or closed. It was definitely the perfect weather for a bit of stew to finish off our day of skiing before we head back to pick up Ethan. 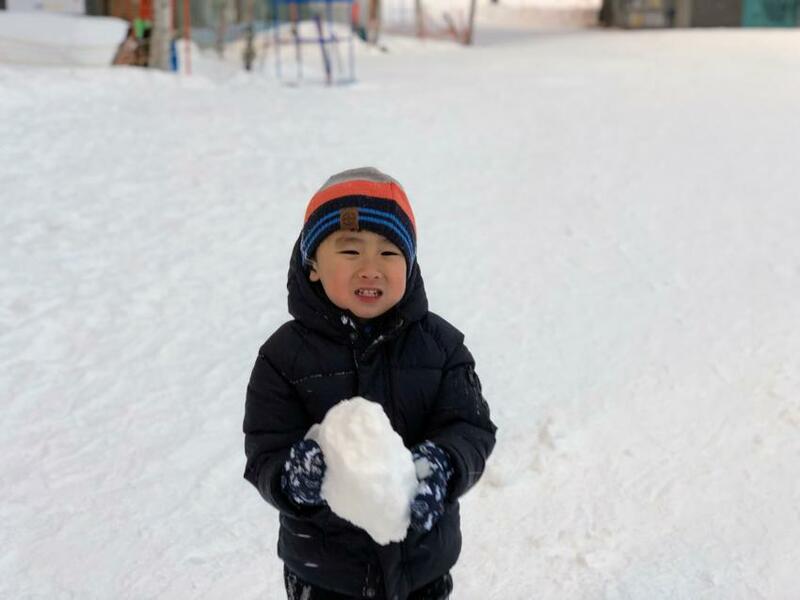 Eventually, we eventually skied our way back the other way as well, to Naeba, to greet our son who once again seemed to have enjoyed the lesson. Given it was our last day of skiing, we tried to take him up for his first ski lift ride! The good thing was that he made it up without a hitch at all! Not that we expected too much from the ski lessons he had, we were simply curious to at least see if he had at least learnt something. So to finish off the day, we made him come down the slope and was quite glad to see a bit of progress! Thankfully, he can at least “slide” down the slope and stop after a few lessons. I can comfortably call it a success at least given the last couple of years simply went no where. Hopefully there will be many more skiing seasons to come.. providing my aging knees can keep up!